We were fortunate to be part of Andy (yang1815) and Sugi’s wedding banquet in Taipei last weekend. Here are some pictures from the banquet (especially the food! 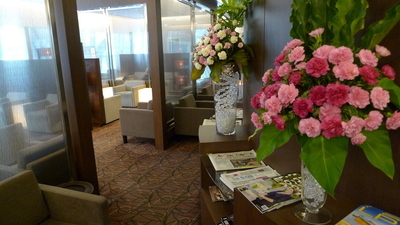 ), which was hosted at the very nice Regent Taipei Hotel. 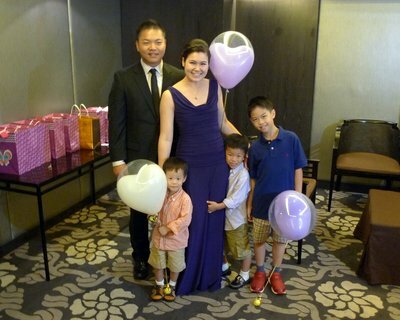 Andy and Sugi pose with their nephews in the greeting room just outside the banquet hall. We had met the middle of the three nephews at the wedding in Maui last year and enjoyed meeting the other two on this trip. There was a large ice sculpture of two cupids about to kiss, melting quickly underneath the lightbulbs. It wasn’t until the way out that someone pointed out to me that the “male” cupid was anatomically correct and, I suppose, less well endowed after two hours than he was at the start of the banquet. Andy’s father speaks to the guests while Sugi’s father, Sugi, and Andy sit at the table and await the first course. Chinese banquets are elaborate affairs. Usually about a dozen courses and great care is taken to choose the best (read: “expensive”) ingredients as a matter of showing a good “face” to the guests. The Yangs certainly were outstanding hosts as this was one of the finest banquets I’ve attended and every course was impressive. Here they are in the order they arrived. 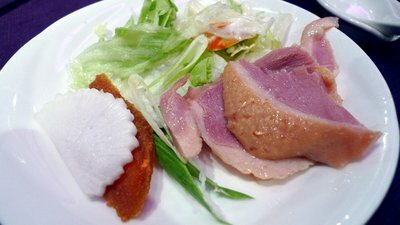 The first plate (everything at this banquets was plated for us, not served off common platters) was an appetizer salad of smoked goose breast. The orange ingredient is a kind of solid “cake” of fish eggs, if I understand correctly, the saltiness of which paired nicely with the tender, smoky goose. 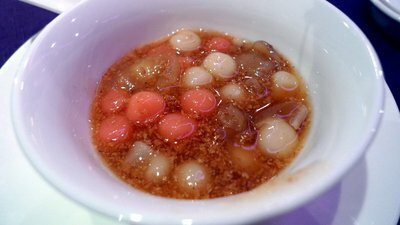 The next course was a small bowl of slightly sweet mochi (sticky rice) dumplings with longan fruit. 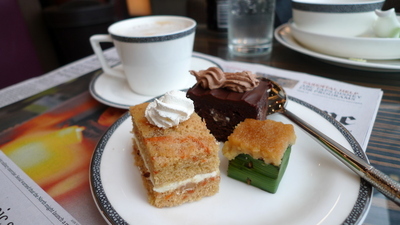 This was an interesting dish that is similar to desserts I have eaten in Thailand. It seemed strange that something dessert-like would be served as a second course, but the dish was tasty. Third course was abalone. This is one of those big-ticket ingredients that impresses guests and this particular succeeded in doing so. 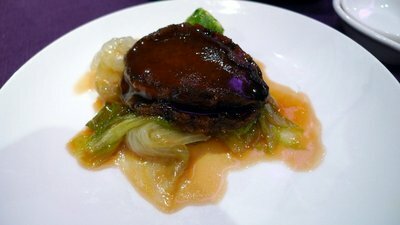 The abalone was tender and flavorful, a really good example of why the price tag is so high. The fourth course was braised scallops. 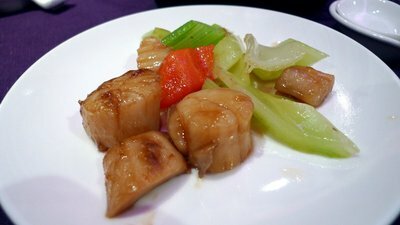 In general, scallops are one of my favorite ingredients and these particular scallops were cooked really nicely. The next course was shark’s fin soup. Yes, this is an unpopular ingredient these days as most shark fins are harvested in a horrific manner. 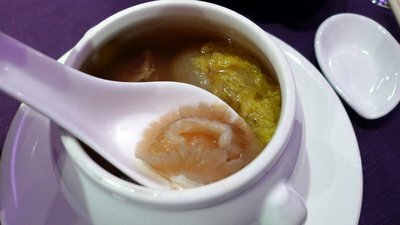 While I don’t know the source of these particular fins, I can say that this was the best shark fin soup I’ve had. Normally, the fins are cut into very thin strips and the broth is murky with cornstarch. This was a clear-broth soup and the fins were in large pieces. 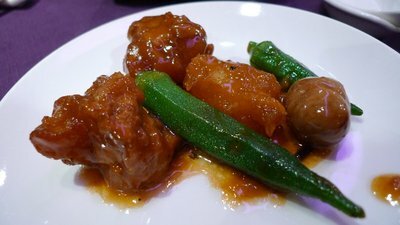 A good example of why this dish is considered a must-have on Chinese banquet menus. 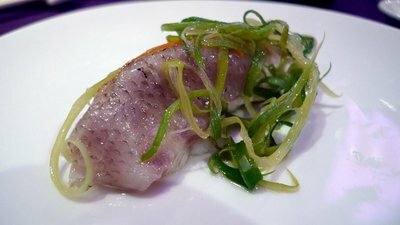 The sixth course was steamed sea bream with scallions. Chinese know how to cook fish and this captured the reason why: steaming keeps the fish moist, captures all the sweetness of fresh seafood, and avoids overcooking. The seventh course was braised pork tendons with okra and chestnuts. The gelatinous texture of pork tendons doesn’t appeal to everyone, I’m sure, but it is hard to beat the flavor! 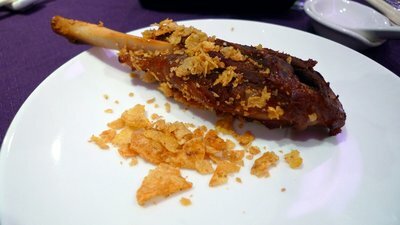 The eighth course was something I’ve never seen before, a pork chop that has been cooked confit style and crusted with what I swear were Doritos and corn flakes. The meat was tender and very tasty. Definitely unusual. 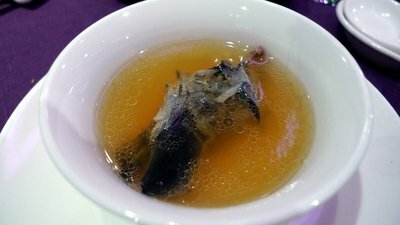 The ninth course was a chicken soup made with “black bone” chicken. This type of chicken has black skin but tastes like any other chicken. One truth, though, is that chickens in Asia (in general, and Taiwan in particular) are so much tastier than the chickens in the United States. 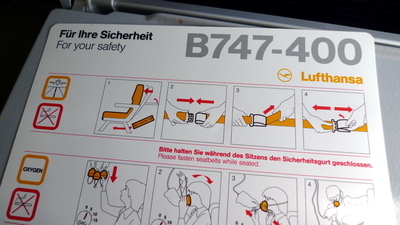 The broth had the type of flavor that you always imagine chicken soup should have, but rarely does. 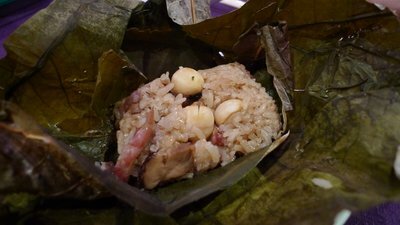 The tenth course was a small bundle of glutinous rice with Chinese sausage, mushrooms, and lotus seeds, steamed in taro leaf. 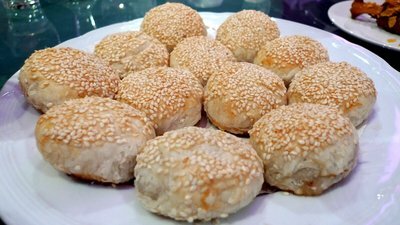 This is a dim sum staple and provided a little starch to help fill you up, just incase the previous nine courses had left you hungry! 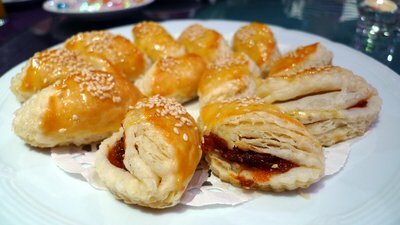 The eleventh course (the first dessert course) was actually two types of pastries, the left one filled with sweetened daikon radish and the right one filled with barbecued pork. These are familiar to anyone who goes to dim sum. 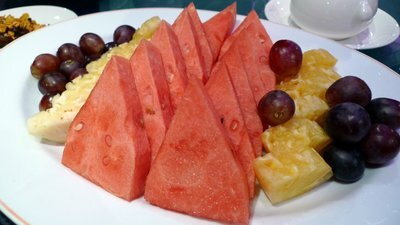 We concluded with a platter of fresh fruit, something sweet but refreshing to conclude the banquet. 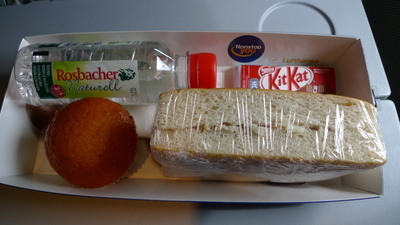 By this point, nobody had the appetite to do more than just nibble! Congratulations to Andy and Sugi and thanks to the Yangs for their very generous hospitality! 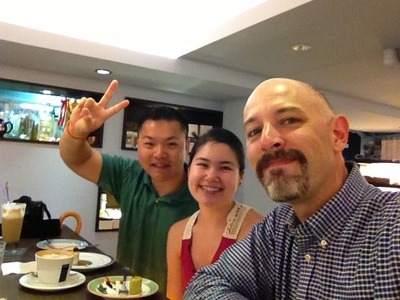 Was in Taipei for a long weekend to attend the wedding banquet for Andy (yang1815) and Sugi. They were married in a beautiful ceremony on Maui last spring and now, a year later, they flew to Andy’s hometown of Taipei to hold the traditional Chinese wedding banquet for his side of the family. Andy and Sugi flew into Bangkok two weekends ago for a short visit and then we flew over to see them (and their families) this past weekend. I have pictures to share and will try to get them posted soon. 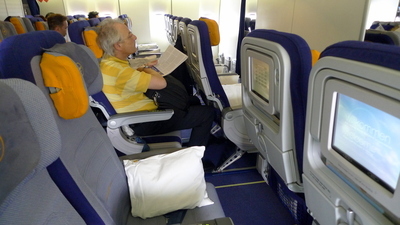 As you have probably guessed from my less-frequent blogging, life has become quite busy for me. On Thong Lor Road, a street that is considered one of Bangkok’s more upscale shopping and nightlife districts, I regularly see a Hummer parked in front of a particular clothing shop. 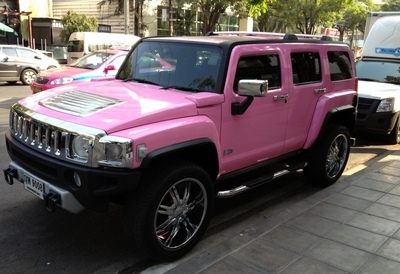 Never mind that the only vehicle more poorly suited for the crowded streets of Bangkok is a dump truck, this Hummer catches my attention because it is bright pink. While I don’t care much for Hummers, I do appreciate that this one defies expectations, a big brawny car in a color more often associated with femininity and softness. Of course, here in Thailand, those sort of cultural presumptions are often knocked on their ear. In my continued unemployment (well, at least I’m not formally employed full-time), I am assisting my friend Chow with testing recipes for the updated edition of her guidebook to Thailand’s best street food. This involves going out to try different dishes in their original context – i.e. on the street – and then returning to her kitchen to try and recreate the dishes, taking notes for how cooks in other countries can modify or substitute techniques and ingredients as necessary. It is a tough job, but someone has to do it. 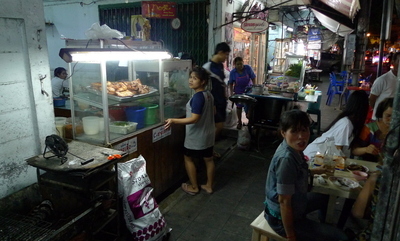 For this group of recipes, we went to a long-established Isaan style street food vendor on Soi Suan Phlu, off Sathorn Road. “Isaan” refers to the northeastern region of Thailand, a dry, poorer portion of the country and also home to a large percentage of the total population. 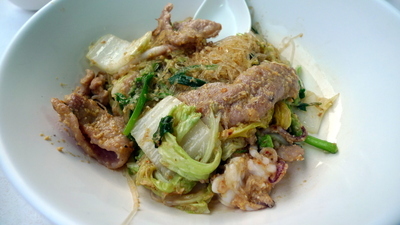 Isaan food is spicy and often uses fermented foods (shrimp paste, fish, chili paste, etc.) to add flavor. While foreigners (and for that matter, many Thais from central Thailand) can find the food a bit too strong, many of the dishes have gained admission to the pantheon of popular Thai cuisine. Chief among these are som tam (green papaya salad), gai yang or moo yang (grilled chicken or pork), and larb (chopped meat and herb salad). 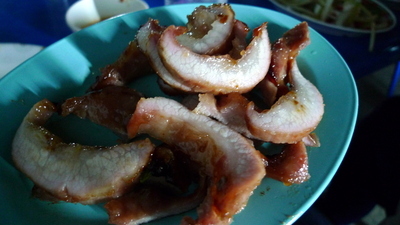 Here is the street vendor’s version of kor muu yang – grilled pork neck. 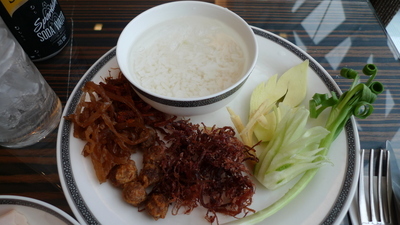 Thai pork is moister and more flavorful than the pork available in the United States, which has been bred to be low-flat and, thus, bland. The neck has plenty of fat and the meat undergoes a quick marinade and then grilling over blazing hot charcoal. Though simple, the flavors are very rewarding to eat. 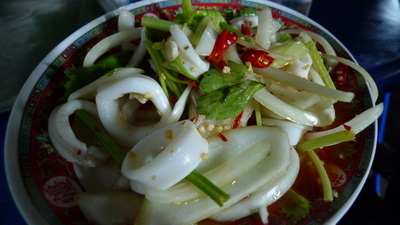 Another dish we tried is the yam plaa muk – squid salad. “Yam” (which means “mix”) refers to a style of salad that originates in Isaan, although of course it wouldn’t originally be served with fresh squid since that region is a long way from the ocean. 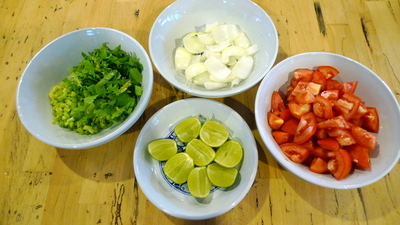 Regardless of the main ingredients, the dressing always includes shallots or onions, lime juice, fish sauce, sugar (usually palm), and fresh chilies. That’s the holy quartet of Thai cuisine: sour, salty, sweet, and spicy. Back at Chow’s kitchen, we tried our hand at yam pla muk. 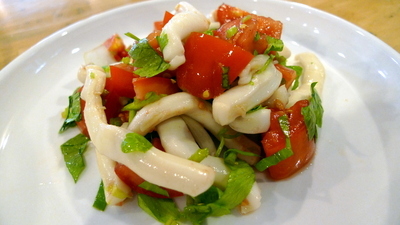 In addition to the fresh squid (it must be fresh or else it will be rubbery), which is cleaned, cut, and boiled very briefly (it must be brief or else it will be rubbery), we added Chinese celery (substitute the leaves and thin ends of regular celery), onion, and tomatoes. Mix all the ingredients in a bowl, along with the sauce ingredients I mentioned in the previous paragraph. The end result is a refreshing, ceviche-like dish that makes for a perfect summer salad. If you don’t like squid or can’t find any, you could use shrimp or fish, too. You could also use chicken, beef, pork (sliced and cooked), or even pomelo. Lots of options. 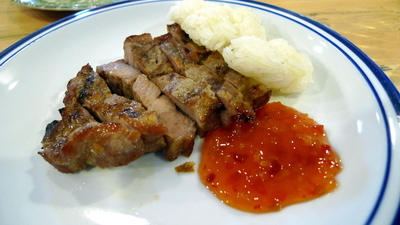 We also tried our hand at muu yang, the grilled pork. Lacking a grill, we seared on a cast iron griddle and then finished the pork beneath the broiler. We were focusing more on the marinade rather than the way the meat was cut and discovered that the marinade recipe will be trickier to figure out than we expected! This will require more experimentation. The red sauce is a bottled sweet chili sauce that is available in most Asian food markets. Served also with some sticky (glutinous) rice, another Isaan staple. While we were at it, we also tried our hand at satay. 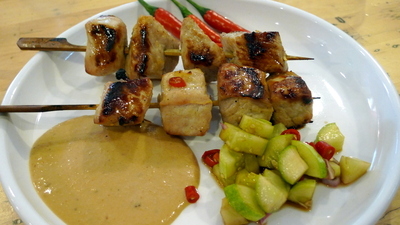 Satay are skewers of meat (in this case, pork and chicken) that are marinated, brushed with coconut milk, and grilled. They actually come from southern Thailand by way of Indonesia. We didn’t focus on cutting the meat into thin strips and instead went for chunks. We did make the peanut sauce from scratch. A lot of recipes available to foreigners substitute peanut butter instead of ground peanuts. Yes, you can do that… but it really doesn’t taste the same. Served with cucumbers, shallots, and chilies briefly pickled in a rice wine vinegar and sugar brine. 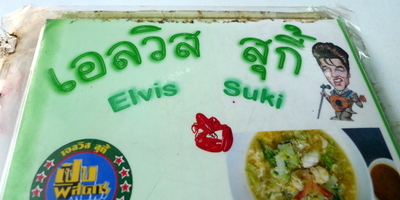 Elvis has left the building and is now selling Thai sukiyaki on a street-side restaurant not far from the Hualamphong Railway Station. Recently, my foodie friend Chow (author of the Bangkok Glutton blog and the helpful street food guide, Bangkok’s Top 50 Street Food Stalls) invited me to join her family for dinner at Elvis Suki. One does not decline a street food invitation from Chow and, once again, her choice was excellent. Sukiyaki is a Japanese style hot pot dish. 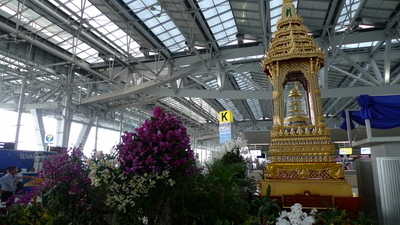 The Thai version bears only a faint resemblance to the original Japanese version. 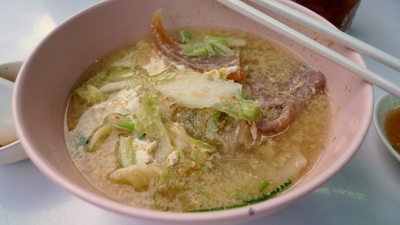 While there is still a hot pot component available at some restaurants, at other restaurants like Elvis Suki, “suki” refers to a bowl of vegetables and meat, with or without mung bean vermicelli, and with or without broth. The one thing it always has is a super-fiery dipping sauce made of chili paste, chilies, lime juice, and cilantro. The above example is a seafood suki with broth. For a little more clarity into what’s inside the bowl, here’s a “dry” version (no broth) of a pork suki. Lots of green veggies and, despite being pork, a piece of squid made it into the bowl. The suki is satisfying, inexpensive, and easy to eat. The dipping sauce is seriously spicy. Be warned. Elvis Suki is also known for their grilled seafood. 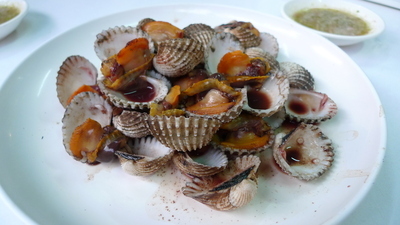 Here is a plate full of cockles served with the dipping sauce. The seafood is very fresh, although I’m not a big fan of the flavor of cockles. 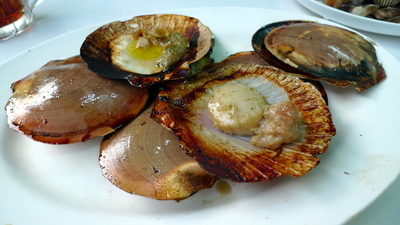 A very un-Thai specialty are these scallops grilled with a piece of fatty pork, slathered in butter and loads of garlic. You wouldn’t think scallops and pork would go together, but they actually make a nice pairing. And with all that butter, who could complain? One other specialty is this hard-to-see whole fish served wrapped in banana leaf and covered with pandan and kaffir lime leaves. The brownish mixture is actually a fine mixture of chopped herbs including lemongrass and galangal root (related to ginger). Needless to say, the fish has this incredible aroma after having been grilled with these herbs. 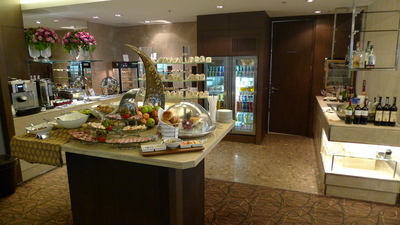 Elvis Suki is worth a visit if you enjoy experiencing true local cuisine. There is also a good homemade ice cream shop right next door so you are covered for dessert, too. 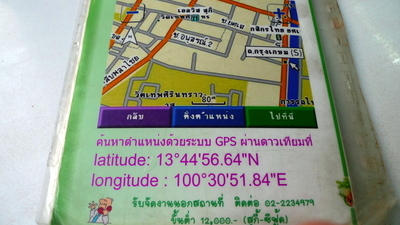 Usually it is hard to explain where you can find these types of restaurants but Elvis Suki’s owners make it easy: the GPS coordinates are on the menu! There are a few entries I’ll share soon of some Thai street food adventures I’ve been on with my friend Chow. In the meantime, I want to share this beautiful sunset picture I took the other day. 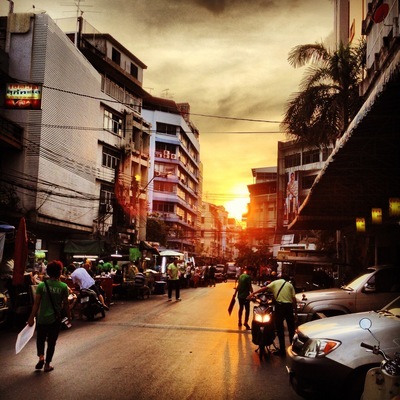 I shot it in an alley off Rama I Road in the old section of Bangkok, known as Rattanakosin Island. This neighborhood dates back more than 100 years and is filled with Chinese-style shop houses. The shop was on the ground floor, a stock room was on the floor above, and then the owner would live on the floors above that. This particular alley is filled with restaurants of various sorts and becomes very busy after work. 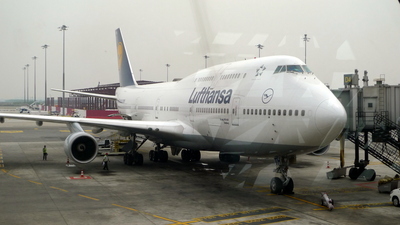 I happened to arrive just after 6:00. My seat at an outdoor table positioned me perfectly to enjoy the minute-long moment of perfect lighting as the sun shined between a few blocks’ worth of buildings and back-lit the activity on the street.